All parts of the world celebrate the harvest and so do the many gardeners who call DG their home. The County Fair is a longstanding agricultural and handicraft tradition that gives gardeners, farmers and artisans the opportunity to showcase their work to the community. We are honoring this popular harvest tradition with our own virtual 6th annual County Fair happening here on Dave's Garden! Who can enter? Any member or subscriber is eligible. What pictures are eligible? 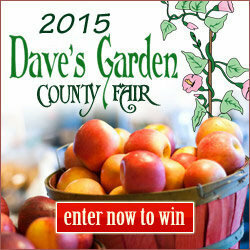 Photos must be your own photos, not entered in any previous contest at Dave's Garden. How many photos can I enter? You may enter two photos per category. How do I enter recipes? Recipes can be entered in a designated thread in the cooking forum. As with the photo categories, you may submit 2 recipes. What are the important dates? Enter between now and September 18. We'll start voting on September 19 and continue thru September 25. Second place winners will receive a 6-month subscription and third place winners will receive a two-month subscription. The voting is finished!! Congratulations to each of the winners. Click below to view the winners of each contest.